Meghalaya Deputy Chief Minister Prestone Tyngsong along with NPP candidate Martin M Danggo on Friday visited Rangthong to seek the mandate of the people for the by-poll to Ranikor constituency to be held on August 23, 2018. 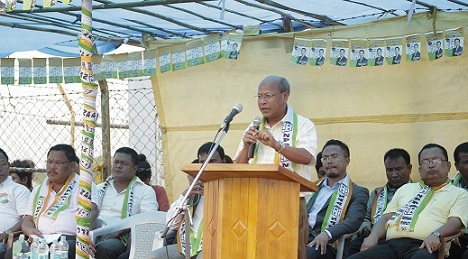 Addressing a rally, Tyngsong said that it has always been the policy of the NPP under the leadership of Conrad Sangma to never indulge in mudslinging or negative campaigning during elections. The party stands for positivity and fairness and it fights elections based on principles and issues that concern the common people. Prestone Tynsong was drawing attention to a recent newspaper report that came out in some local newspapers about a leader from a political party who branded Danggo a ‘defector’. Tyngsong clarified that under the Constitution, an MLA, who resigns from his post to re-contest the seat is ‘not’ a defector. “Danggo cannot be called a defector because he first resigned from the post of MLA and from the Congress party and then joined the NPP,” said Tynsong. Tynsong also dismissed claims by the same leader that Danggo was ‘tempted’ to join the NPP because of the granting of Ranikor civil sub-division. He said that Danggo sacrificed the seat for the sake and betterment of the people of Ranikor constituency. He recalled that in 2013, Danggo’s opponents called for his defeat for failing to get Ranikor a civil sub-division. “But today those same opponents are calling for his defeat because of the flimsy reason that the by-election is causing an inconvenience to the people,” said the Deputy CM. He went on to elaborate that the Ranikor civil-sub division is a blessing to the people of the region because it will bring the government closer to the people. 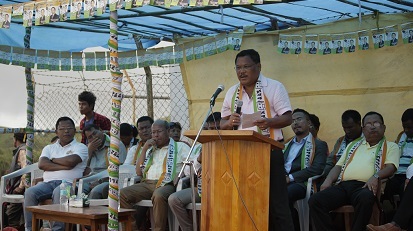 Talking about agenda of the NPP under the leadership of Conrad Sangma, Tyngsong said that various projects are already on the anvil to further improve infrastructure and livelihoods of the people of the region which includes the SARDP road project and the re-opening of border haats, stated an NPP communication cell communique. Ex-MLA of Ranikor constituency and NPP candidate Martin M Danggo recounted the struggles that he undertook to get the civil sub-division for Ranikor when Dr DD Lapang and Dr Mukul Sangma were chief ministers of the State. He said, despite numerous requests and prayer, both of them refused to consider the case for many years. In desperation, he and his party workers decided to approach Chief Minister Conrad Sangma demanding upgradation of Ranikor as civil sub-division this year. Taking into consideration the genuine needs of the people of the constituency, the MDA Government under the leadership of Conrad Sangma granted the request. Danggo said he resigned from the post of MLA as a mark of gratitude to Chief Minister Conrad Sangma and said he believed that “NPP is the only party that can bring real development to the people of the region and the State as a whole”. The rally was attended by NPP State president Dr W Kharlukhi, Minister of Industries Sniawbhalang Dhar, Williamnagar MLA Marcuise N Marak, Mawshynrut MLA Gigur Myrthong and MDC of Sohryngkham, Pyniaid S Syiem, it added.